The boys of fall are back. Gridiron fans around the country can now rejoice as football season has officially returned. For the students and faculty of Wesleyan, this means the bleachers have arisen on Andrus Field once again, creating the beloved Corwin Stadium. As Wesleyan football gets ready to take the field, let’s first recap last season. The Cardinals are coming off a solid 6-3 season with an impressive 4-0 record at home. A major key to their success was defense. The Birds allowed a stellar 16 points per game, proving they had one of the best defenses in the NESCAC. However, just like any new season, there are some changes. 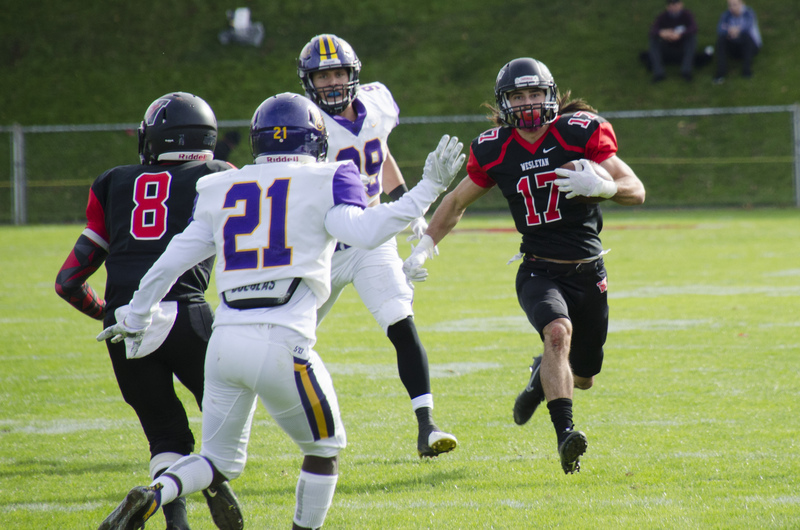 Wide receiver Mike Breuler ’18 is no longer with the Cardinals. Last year, he was named NESCAC Offensive Player of the Year, as well as a member of the DIII All-American Honorable Mention list. He racked up countless accolades his senior year because, to put it simply, he balled out. But he has graduated. So, where does the team’s offense go now? Enter senior quarterback and captain Mark Piccirillo. Piccirillo has been an outright starter at Wesleyan since his freshman year. He has more than enough talent and experience to lead the Cardinals this season. Through all his experience, Piccirillo knows that preparation is a big key to success on the gridiron. The Cards will need that confidence, as they have high expectations for this season. The team definitely has Middlebury on its mind, and for good reason. The past four years have proven that the first weekend game isn’t easy. Personally, this writer is excited to watch running back Dario Highsmith ’20 make more crazy acrobatic plays like he did last season. He’s a playmaker (his position was formerly listed as simply “athlete”) with huge potential at the DIII level. A native of Middletown, Highsmith has a lot to prove this season alongside a solid cast of offensive weapons such as Sean Penney ’21. In addition, when we talk about the football team’s success, we cannot forget a major part of the team: the coaches. Overall, the football team is amped up. Every player that I interviewed was extremely excited and answered every question with enthusiasm and passion. I could really feel it. One such player was Harrison Karp, a sophomore lineman. When asked his favorite thing about playing football, Karp said he enjoys the little, often unnoticed aspects of the game. This year has the potential to be historic for the Cardinals; it’s certainly something to get excited about. Ben Owen can be reached at bowen@wesleyan.edu and @benjaminowen28 on Twitter.